I like this little challenge I saw on the Anderson family crew. Every Thursday you're supposed to embrace the camera and get out from behind the camera and get a pick of yourself with your little person. So, yesterday I took a quick pic of me and my girl. I was leaving for work and her nana was coming to pick her up to babysit. It's been brought to my attention that I'm a little emotional. Well, yes, I am. I could stop here and leave you with a happy thought. But no, I will continue and tell you how the rest of the day went. About 5 minutes after this picture was taken I was a mess (and by mess, I mean a blubbering fool. Couldn't stop crying.) I walked my little girl to her nana's car and kissed her good-bye. I went to work from 8-4:30 yesterday - longest day away from my baby since she was born. I was a mess the whole way to work. I finally pulled myself together and dried up the tears, drove circles in the parking lot to clear up the redness so everyone didn't ask me if I was okay and finally made my way in. I soon realized I was in 30 min. early! I was glad for this. There weren't many people in yet so I got to have a little extra time to pull myself together. I got my coffee and breezed through the first half of the day. Then lunch hit and the end was in sight. Only 3.5 more hours until I got to see my baby girl again. But then my sister sent me an email that made my afternoon. The subject was "pea in a bucket." My first thought was, oh my, what have her kids done this time! 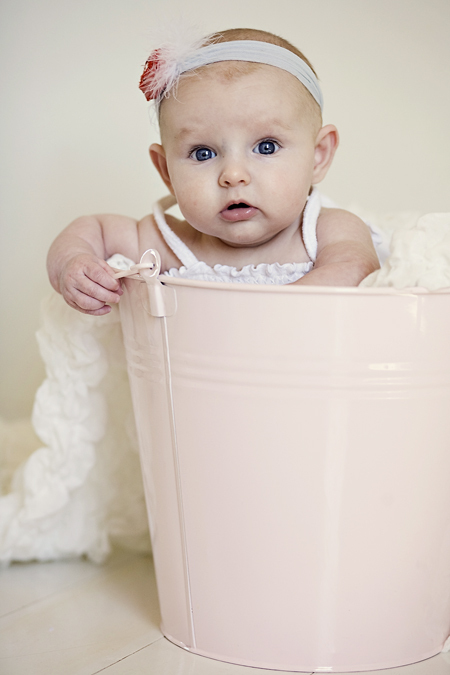 But then I got to see my sweet little girl in a bucket!! Love it. Nana took Sweet P over to her auntie's in the afternoon. She agreed to take P's 3 month pics so I baked her oatmeal cream pies and oatmeal chocolate chip cookies. Anyway, 4:30 finally hit and I was out the door. No time for small talk, I had a baby to see. I am thankful I don't have to work full-time in the office right now and am even more thankful for my family that watches my girl when I do have to go into the office. Hope you all have a great Friday!! I love both of the pictures! I'm sorry that Thursday was rough on you. I don't have a baby yet but I can imagine I'll be the exact same way. hellloooo! love this picture of you two together :) sorry your day was hard though. and the pea in a bucket...your sister is fabulous! A Teaser of What's To Come!